SCC gymnastics championship action at Jonathan Law in Milford, Conn., on Saturday Feb. 7, 2019. Behind the all-around effort of junior Mia Lawrence, and the team performance of Mercy, the Tigers took home the Southern Connecticut Conference gymnastics title, edging Hand 133.30-131.40. The victory not only ended the 10-year hold Hand had on the crown, but also stops the two-year run in which Mercy finished second to Hand. Jonathan Law (127.150) was third, Foran placed fourth (117.65) and Hamden (110.80) rounded out the top five. Mercy, competing for just the fourth year as a team, became just the first team other than Hand (who had won 21 of the first 23 titles), Foran (2008) and Law (2007) to take home the title. Mercy came out of the gates very well, excelling on the vault with Lawrence leading the way with a 9.20. Lawrence won the bars with a 9.10, before placing third on the beam with an 8.20. When the team needed her most, Lawrence was there. 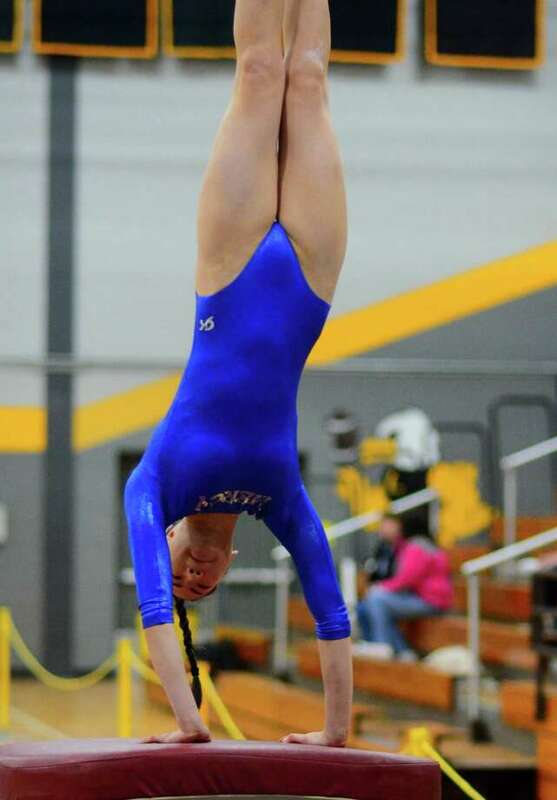 The junior ruled the floor exercise with a SCC record 9.65 to help clinch the title. In an evening full of brilliant performances, several stood out among the best. Sacred Heart Academy’s Megan Connelly dazzled on the vault with a 9.10 for a second place finish, while Mercy’s Charlie Weaver was third at 8.45. The bars saw Hand’s Grace Rogers place second with an 8.60 and Connelly finish third at 8.50. Rogers won the beam at 8.80, Connelly was second at 8.50, Catherine Burns of Law was fourth at 8.0 and Brooke Kustra of Branford was fifth at 7.90. Hand’s Paige Dean (9.25) and Rogers (9.20) were second and third, respectively, in the floor exercises. The All-SCC team had solid representation from each team as Lawrence was named the Most Outstanding Gymnast. Mercy was also represented by Weaver, Kaci Buono, Cece Vess and Annie Berger. Hand placed Rogers, Dean, Kelley Levis and Carly-Anna Barba, while Law’s Emma Nelly, Kylee Troy, Burns and MaKenna Sharpe, Branford’s Kustra, Foran’s Samantha Lambert, Sacred Heart’s Connelly, and Hamden’s Taylor Emmerich and Alexis Sangiovanni rounded out the squad.